I love reading. For lent this year, my wife and I have switched off the TV and are giving our noses some more book time. 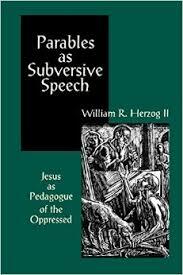 There are two books I’ve read this past 12 months which have impacted me deeply: “Parables as Subversive Speech – Jesus as Pedagogue of the Oppressed” by William R. Herzog II and “The Prophetic Imagination” by Walter Brueggemann. I would seriously recommend them to you, whatever your faith or political background – they are challenging to the core. I want to blog a mini series on l essons I have learnt and thoughts that have provoked me as I have read. One of the people whom I hugely admire is Mehdi Hassan. I admire his courage to speak his mind, to be unashamed about what he believes as a Muslim and his passion in debate. I have felt challenged by the way he puts his faith front and centre whilst engaging deeply in the political issues of our day. I make no secret of the fact that I am a man who loves and follows Jesus (not very good at it, but hey-ho!). The more I have discovered about Jesus, especially over the last few years, the more I have found I love him. My world view is shaped by his radical love for ‘the other’ and for ‘the enemy’, his prioritisation of women, children, the poor, the sick, the prisoner and those generally hated or ostracised by society. There is no-one in history who has ever brought such a sharp critique of Imperial Systems that commodify human life like fodder to feed an economic machine or challenged the status quo mindsets to the extent that he did. Nor did anyone else release such deep hope of a reimagined future. And yet, those of us who claim to follow him have so often utterly missed his point and have been more caught up in creating a religion around him that he never intended anyone to build, partnering with empire in the process rather than criticising it and bringing transforming love and economic justice to all of the creation. I hope this mini-series inspires some good conversation, either online or around some dinner tables about the world we live in and how we engage with it. For me, the parables of Jesus have as much dynamic power to shock us today as they did for his first listeners. Put aside any hang ups about ‘christianity’ or ‘politics’ and let the subversive stories make you think.